He is finally here! General Grievous has been added to the 2017 release of Star Wars Battlefront 2. People first found out that the general would most likely be in the game when early players of the game went through the game’s files and found a model of him. Ever since that was leaked, players have been eagerly waiting for the general to be a playable hero in the game. Players started to believe that General Grievous would never be in the game after 2 DLC (Downloadable Content) seasons went by with no news about when Grievous would be playable and EA is known for not being player friendly. 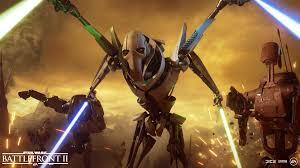 However during the EA play event on June 9th, 2018, it was revealed that General Grievous would finally be coming to the game in the next DLC season focusing on the clone wars. It was also said that he wouldn’t be the only hero coming from the DLC season. Obi-Wan Kenobi, Count Dooku, and Anakin Skywalker will also be added but on future dates. A lot of people, including yours truly, got really hyped for the season when this was announced. Many people believed that this season would breath new life into this game after its rough start and continual disappointment. The hype grew even more when a few months later, people went through the game’s files again and found animations for the general. You could even use these animations if you equipped them to Darth Vader. Players had to wait for 4 months, but General Grievous was finally added to the game. Many people believe that Grievous brings new player or old players that stopped playing to Battlefront 2 and it certainly has. Grievous is very fun to play as. I hope people will continue to play this game in future!